Home »Posts Tagged "Digital Marketer"
Ok we all know that facebook is not just for networking, making friends, chatting, sharing moments or whatever since both individuals and businesses are met there. Above all, facebook has paved the path to social media marketing and evolved to a robust and leading marketing tool that marketers cannot leave out. 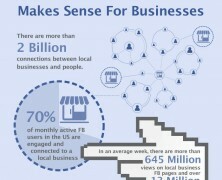 See why all that frenzy with Facebook. 7 in 10 marketers believe that the role of marketing is going to dramatically change within the next 5 years as they feel and endorse the big turn to digital marketing. See how they plan to keep up with this shift.